Tagged with: It's made from WHAT? Jon can attest to this, because I've been badgering him to get me some White Lion VSOA ever since I gave up on finding it in Boston. White Lion is a Ceylon arrack, the distillate of fermented coconut flower nectar (not, as previously posted, fermented palm sap; thanks go predictably to Jon for the correction). Like the name suggests, it's made primarily in Sri Lanka. White Lion is the only company currently selling it in the U.S., and at present, it's only available in California, Illinois, Minnesota, Wisconsin, and Wyoming. Don't ask me why they picked those five; must be a vendetta against the east coast or something. Fortunately, while I wait for my Chicago palm brandy to arrive, I've stumbled on something much closer to home and even stranger: Chesuncook. Called a gin by its makers at Maine Craft Distilling, I suppose it technically is. Juniper is the dominant flavor, making it a ginnier gin than a lot of American entrants in the category. But the base distillate, rather than being derived from a cereal grain, is made from carrots. Apparently there is some history of drinking carrot booze. Distiller Luke Davidson swears that he knew "a lot of people" who made carrot wine when he was growing up. (No, really.) And I suppose it's not so far-fetched. Potatoes and ginger roots are very happy to ferment - why should carrots be any different? In the photograph, you can see that it has a slight orange tint, which, absent mention of coloring agents, I'm forced to believe is natural. The rest of the botanicals are a bit unusual for gin, including basil and mint, but downright conservative by contemporary standards - be they French, Scottish, Oregonian, or Scottish again. Ryan Magarian, one of the minds behind Aviation, has a very interesting take on the modern world of gin, kindly published at Drink Spirits for us all to read. He's in favor of recognizing the increasingly common non-juniper-forward spirits as a distinct subcategory, called "New Western Dry Gin." That would make life easier for those of us used to saying, "Well, it's a gin, but it's not a super juniperry gin, and it's not, like, a dry gin - definitely not a London dry, I mean, it's not even English - but it's really botanical, you know? Like vegetal, but not too savory? No, it tastes nothing like Hendrick's," every time a new gin comes on the market. On the other hand, each expansion of the gin palette (or palate, for that matter) further exposes the category to what no one wants to admit: it's entirely arbitrary. Distinguishing bourbon, brandy, and applejack is natural, since they're made from different things. Distinguishing "gin" from spice-infused vodka is surprisingly difficult. Magarian, and serious gin-makers generally, still recognize that a gin must be flavored "predominantly" with juniper. There are a thousand other elements to the craft and tradition of gin-making, driving at goals wildly different from those of flavored vodkas; but these are hard to understand when you only see the gin in the bottle or in the glass. In practice, the juniper berry is the throughline of gin, from its first distillation to the present and from England to Australia. A reasonable person may nevertheless wonder whether the rise in popularity of "gins for non-gin-drinkers" is watering down the category. 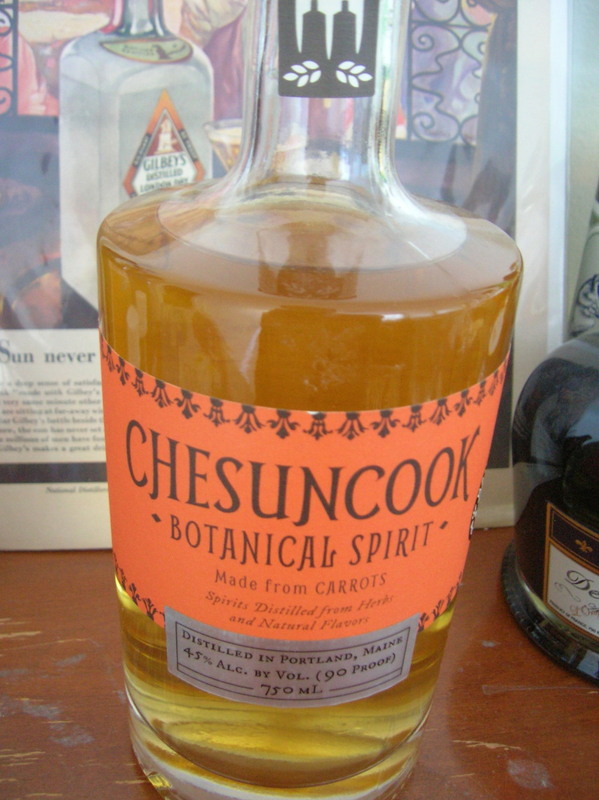 Chesuncook is decidedly not a gin for non-gin-drinkers. It is a gin for Maine gin drinkers, and perhaps best of all for Acadian gin drinkers. It'll put hair on your chest, is what I'm saying. After my first sip, I swear I could hear better - as if the spirit had burned its way up my sinuses to clear out my ear canals. It exists on a flavor spectrum of which the extremes are carrot juice and London dry gin, noticeably closer to the latter. The nose is warm, summery, and a bit fruity. There's a wallop of of juniper throughout the sip. "Earthy" is a common tasting note; it's accurate, but the element is subtle. The other botanicals sit quietly in the background. This is my first encounter with Maine Craft Distilling, and I don't expect it to be my last. I'd be very curious to know whether the folks there wanted to make a gin from the start, or tried Undoctored Carrot Spirit (Carrot Brandy? Carrot Whiskey? Carrotjack?) and found it lacking. The Portland Press Herald's survey of local gins seems to imply the former, but the surplus carrots they found could easily have come before the idea. I'd like to take a moment at this juncture to recognize Liquor World, in Porter Square, Cambridge, for living up to their motto of "Curious Beers, Smart Wines, & Adventurous Spirits." Few are the liquor-sellers to have provided me a novel organism to drink. These guys are generally fond of things weird, and have the most comprehensive selection of local spirits I've seen in greater Boston.